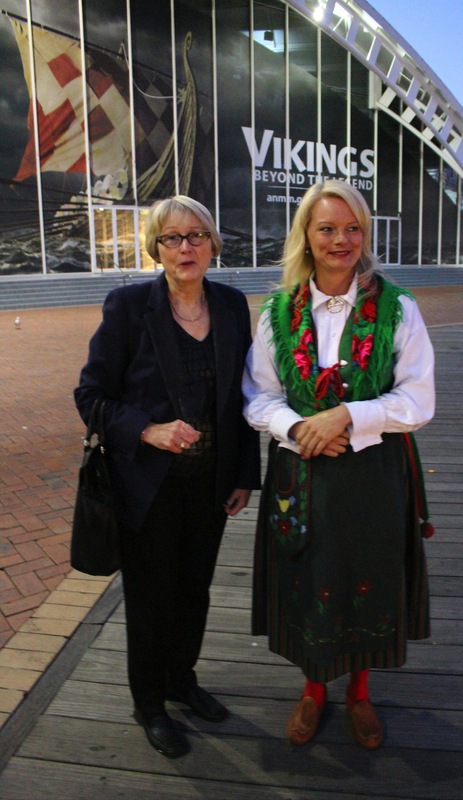 Teresia Fors, Managing Director Australia & New Zealand of Viking River Cruises showed off her Swedish national dress at the recent launch of the Australian National Maritime Museum’s exhibition “Vikings – Beyond the Legend” at Sydney’s Darling Harbour. Teresia said her grandmother wove the fabric, her mother did the embroidery and her great-grandmother made the blouse, truly a family effort. Swedish food and even bottles of Viking Beer enhanced the Viking mood throughout the evening. An exciting highlight was the “invasion” by Vikings holding flaming torches, followed by a swordfight, as Vikings watched to cheer on the victor. The loser was carried away on a stretcher, after which the exhibition was declared open. 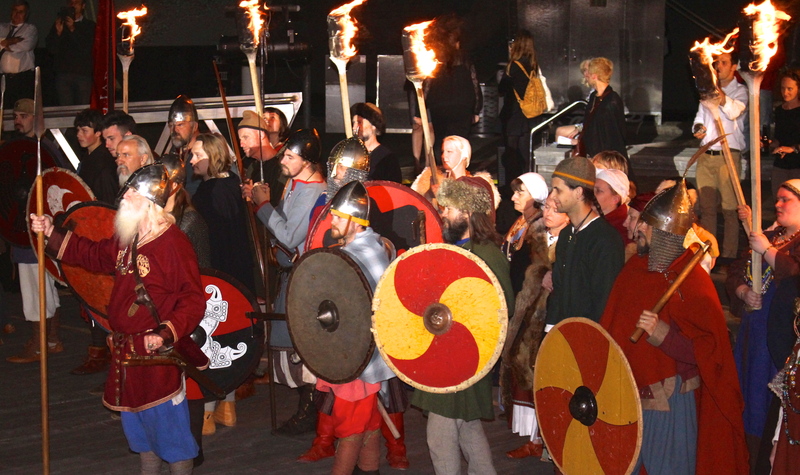 The Vikings provided a guard of honour as guests entered the Museum to view the exhibition. Viking Cruises is a major partner of the exhibition, showing at the Museum for a limited time. Direct from Sweden, the variety of treasures on display reveal how the Vikings lived, going beyond the myth of Vikings as ferocious plunderers in horned helmets. Amongst the artefacts that have never been seen in Australia before are Viking swords from 700-1100AD, bronze and silver jewellery, statuettes of Norse gods, gold and silver pendants as well as an eight metre replica of a Viking boat plus a restored reconstruction of a 9th century ship. This entry was posted on Sunday, September 22nd, 2013 at 9:14 am and is filed under Uncategorized. You can follow any responses to this entry through the RSS 2.0 feed. You can leave a response, or trackback from your own site.